The genus Bhutanitis has four recognized species distributed from northern India and China to Thailand (Häuser et al., 2005). All four species have been protected by law for a long time (Collins and Morris, 1985; Coote, 2000), although recently only two of these species (B. ludlowi and B. mansfieldi) are listed by IUCN as vulnerable or data deficient (IUCN, 2004; UNEP-WCMC, 2006). A recent molecular study (Zhu et al., 2005) investigates the phylogenetic relationships among the species of Bhutanitis using sequences of COI mitochondrial gene, and provides evidence for synonymy of the taxon Bhutanitis mansfieldi pulchristrata with nominal B. m. mansfieldi. Nazari et al. (2007) provide further evidence for the phylogeny of Bhutanitis species based on a much larger dataset of molecular and morphological characters. Blanchard (1871) described the species thaidiana under new genus Armandia. The generic name Armandia Blanchard, 1871 is invalid as it is a junior homonym of Armandia Filippi, 1862 (Hemming, 1967). Atkinson (1873) described the species lidderdalii under a new genus Bhutanitis. After the description of Armandia mansfieldi by Riley in 1939, based on an unlabeled specimen from China, doubts were raised as to whether this new species belonged to Bhutanitis since it apparently shared many morphological characters with Luehdorfia. 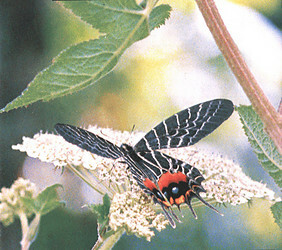 In 1980 Hiura described a new genus, Yunnanopapilio (Type species: B. mansfieldi). Based on genitalic characters, Yunnanopapilo was later synonymized with Bhutanitis (Saigusa and Lee, 1982). Further evidence on the life history of B. mansfieldi supported this decision (Igarashi, 2003). Lee (1986) uses the generic names Yunnanitis and Sinonitis for B. mansfieldi and B. thaidiana with no reference to their authorship and publications. Since these names do not seem to be indicated anywhere else, they are treated as numina nuda here. Atkinson, W.S., 1873. Description of a new genus and species of Papilionidae from the south-eastern Himalayas. Proc. Zool. Soc. Lond. 1873: 570-572. Blanchard, E., 1871. Remarques sur la faune de la principauté thibétaine du Moupin. C.r.hebd. Séanc. Acad. Sci., Paris, 72: 807-813. Coote, L., 2000. CITES identification guide - Butterflies: Guide to the Identification of Butterfly Species Controlled Under the Convention on International Trade in Endangered Species of Wild Fauna and Flora. Ottawa: Canadian Wildlife Service. Igarashi, S., 2003. Life history of Bhutanitis mansfieldi in comparison with those of related species. Butterflies (Publication of the Butterfly Society of Japan), 35:20-39. IUCN red list of threatened species 2004. Accessed January 2006. Lee, C., 1986. First report on the life histories and phylogenetic position of two Chinese Papilionidae, Bhutanitis mansfieldi and B. thaidiana. Yadoriga 126: 17-21. Riley, N.D., 1939. A new species of Armandia (Lep. 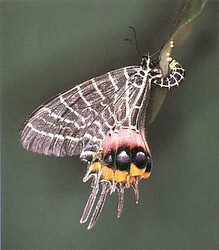 Papilionidae). Entomologist 72: 207-208. Saigusa, T., Lee, C., 1982. A rare papilionid butterfly Bhutanitis mansfieldi (Riley), its rediscovery, new subspecies and phylogenetic position. Tyô to Ga 33: 1-24. UNEP-WCMC species database, 2006. Accessed January 2006. Zhu, L.X., Wu, X.B., Yan, P., 2005. Molecular phylogenetic relationships among four species of Bhutanitis (Lepidoptera: Papilionidae) based on partial COI gene sequence. Acta Zootaxonomica Sinica 31: 25-30. Igarashi, S.,1985. Some ecological observations on Bhutanitis lidderdalei inhibiting misty forests. Yadoriga 123: 24-26. Igarashi, S., 1989. On the life histroy of Bhutanitis lidderdalei Atkinson in Bhutan. Tyo To Ga 40(1): 1-21. Page: Tree of Life Bhutanitis Atkinson, 1873. Authored by Vazrick Nazari. The TEXT of this page is licensed under the Creative Commons Attribution License - Version 3.0. Note that images and other media featured on this page are each governed by their own license, and they may or may not be available for reuse. Click on an image or a media link to access the media data window, which provides the relevant licensing information. For the general terms and conditions of ToL material reuse and redistribution, please see the Tree of Life Copyright Policies.